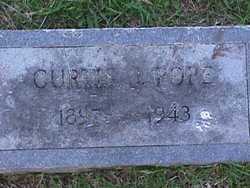 Constable Curtis Pope succumbed to injuries sustained on January 21, 1943, almost 11 months earlier, when a portion of his nose was bitten off while attempting to arrest a man for passing a bad check. When Constable Pope told the man he was under arrest, the man grabbed onto a post on the front porch and refused to comply. Without warning, the man then punched Constable Pope in the stomach, knocking him to the ground, and then jumped on top of him. The man then bit off a portion of Constable Pope's nose during the ensuing struggle. Constable Pope was able to stop the assault by shooting the suspect four times. After being shot, the suspect stated he was going to get his gun and Constable Pope sought medical assistance at a neighbor's house. The suspect was taken into custody by responding officers. The man was taken to a local hospital where he died several days later. Constable Pope contracted a blood stream infection as a result of the injury to his nose. He was taken to the Mayo Clinic in Rochester, Minnesota, to undergo treatment of the new drug penicillin. He returned to Lancaster without improving and died of his injuries on December 11, 1943. Constable Pope is survived by his wife, two daughters, a brother, and four sisters. On today, the 75th anniversary of your death I would just like to say thank you for your service and sacrifice for the citizens of Lancaster County. And to your Family and loved ones, I wish to extend my deepest sympathy.